Molly's Game is a 2017 American biographical crime drama film written and directed by Aaron Sorkin (in his directorial debut), based on the memoir of the same name by Molly Bloom. It stars Jessica Chastain, Idris Elba, Kevin Costner, Michael Cera, Brian d'Arcy James, Chris O'Dowd, Bill Camp, Graham Greene, Claire Rankin, Joe Keery, and Jeremy Strong. The film follows Bloom (Chastain), who becomes the target of an FBI investigation of the underground poker empire she runs for Hollywood celebrities, athletes, business tycoons, and the Russian mob. Principal photography began in November 2016 in Toronto, Ontario, Canada. The film premiered on September 8, 2017, at the Toronto International Film Festival, and began a limited theatrical release in the United States on December 25, 2017, by STXfilms, before expanding wide on January 5, 2018, and grossed $59 million worldwide. 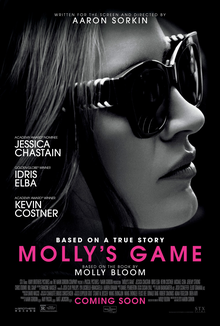 Molly's Game received positive reviews, with particular praise for Sorkin's screenplay, as well as Chastain and Elba's performances, with the former being considered one of the best of her career by some critics. The film earned Chastain a Golden Globe nomination for Best Actress – Drama, while Sorkin earned nominations for his screenplay at the Academy Awards, Golden Globes, Writers Guild of America Awards, and BAFTA Awards. Molly Bloom is a world-class mogul skier with Olympic aspirations, the result of years of enforced training from her overbearing father. In a qualifying event for the 2002 Winter Olympics, she is severely injured, ending her career. Instead of following her original plan of attending law school, Molly decides to take a year off and move to Los Angeles. Once she arrives, she becomes a bottle service waitress at a club, where she meets Dean, an ostentatious but unsuccessful real estate developer. She becomes his office manager, and he soon involves her in running his underground poker games. Many famous and wealthy individuals, such as movie stars, investment bankers, and sports players, are involved in Dean's game. Molly earns large sums of money on tips alone. Molly is initially uninformed on poker topics but quickly learns how to appeal to the players to gain tips. In particular, she hopes to please the most successful player, Player X, by attracting new players to the game. Dean, upon seeing that Molly is becoming increasingly independent in running the games, attempts to control her, and then he fires her. Molly, having gained contacts through years of running the game, decides to create her own poker games. She rents a penthouse at a hotel and hires a staff to help her run games. Additionally, she contacts employees at clubs and casinos to try and spread word about her poker games. Player X, along with many other players, decides to leave Dean's games to play at Molly's game. Molly becomes increasingly successful, gaining more money while being pressured by Player X to raise the stakes for her games. Harlan Eustice, a skilled, conservative, and successful player, joins Molly's game. One night, after accidentally losing a hand to the notorious worst player in Molly's circle, Harlan becomes increasingly compulsive, suffering heavy losses (later, Molly finds out that Player X, who enjoys ruining people's lives more than the game itself, has been funding Harlan to keep him in the game). After Molly berates him for his unethical actions, Player X decides to change venue for his games, and the other players join him, leaving Molly. Molly moves to New York, with the hope of beginning a new underground poker game. After reaching out to many wealthy New Yorkers, Molly finds enough players for several weekly games. Despite continuous success, she fears being unable to cover her losses when players cannot pay. Her dealer convinces her to begin taking a percentage of large pots, allowing her to recoup her potential losses but making her game an illegal gambling operation. One of her Los Angeles players is indicted for running a Ponzi scheme; Molly is investigated and questioned as to who attended her games. At this time, Molly becomes increasingly addicted to drugs, as the games have increasingly taken their toll. Her players also begin to include wealthy individuals from the Russian mafia, among others. She is approached by several Italian mafia members who offer their services to extort money from non-paying players. After she declines, she is attacked in her home, where she is held at gunpoint and her mother's life is threatened. As she is about to return to her poker games, the FBI conducts a raid, a result of Douglas Downey, one of her players, acting as an informant. Molly's assets are seized, and she returns home to live with her mother. Two years later, Molly has moved out and published a book where she names a few individuals that played in her games. She is arrested by the FBI and indicted for involvement in illegal gambling with the mafia. She enlists the help of Charlie Jaffey, a high-profile and expensive lawyer in New York, who agrees to help after he learns that she has been protecting innocent people who were affected by her poker games. While she is in New York awaiting trial, her father, Larry, seeks her out and attempts to reconcile with her. He admits that he was overbearing and that he treated Molly differently than her brothers because she had known about his affairs. Charlie reads Molly's book and becomes interested in helping her case, as he feels she has not committed serious enough wrongdoing to merit a prison term. Charlie negotiates a deal for Molly to receive no sentence and for her money to be returned in exchange for her hard drives and digital records from gambling. Molly declines this deal, fearing that the information about her players would be released, and she pleads guilty. The judge, deciding that she had committed no serious crimes, sentences her to community service, probation, and a $200,000 fine. Idris Elba as Charlie Jaffey, Molly's lawyer. Kevin Costner as Larry Bloom, Molly's father and a clinical psychologist. Michael Cera as Player X, a composite of several Hollywood celebrity gamblers from Molly's ring. Jeremy Strong as Dean Keith, the real estate developer who brings Molly into the world of underground poker. Chris O'Dowd as Douglas Downey, the man who introduces Molly to the Russian mob and brings them to the table. Brian d'Arcy James as Brad, a hedge fund manager. Bill Camp as Harlan Eustice, a card shark who gets in over his head. Claire Rankin as Charlene Bloom, Molly's mother and Larry's wife. On November 12, 2014, Mark Gordon's The Mark Gordon Company bought the feature film adaptation rights to Molly Bloom's memoir, Molly's Game: The True Story of the 26-Year-Old Woman Behind the Most Exclusive, High-Stakes Underground Poker Game in the World, which Gordon produced. Aaron Sorkin was hired to adapt the memoir into a screenplay. Bloom had already approached Sorkin, as he was her "favorite writer". On January 7, 2016, it was announced that Sorkin would make his directorial debut on the film, for Sony Pictures Entertainment, while Amy Pascal also produced. On February 18, 2016, Sony exited the project, and on May 13, 2016, STX Entertainment came on board, and subsequently bought the film's US and Chinese distribution rights for $9 million. On February 18, 2016, Sorkin offered Jessica Chastain the lead role in the film, but the negotiations between them had then not yet begun. On May 6, 2016, Idris Elba joined the film to star alongside Chastain. Sorkin stated that "the casting of Jessica and Idris in the two lead roles is any filmmaker's dream come true, they're two of the greatest actors of their generation, paired for the first time, and their chemistry will be electric." On September 7, 2016, Michael Cera joined the cast as Player X, a celebrity poker player. On October 17, 2016, Kevin Costner joined as Molly Bloom's father, and on October 21, 2016, Brian d'Arcy James was added. On November 9, 2016, Chris O'Dowd, Jeremy Strong, Bill Camp, and Graham Greene joined the cast as well. Molly Bloom herself discussed Chastain's portrayal of her character with ET Canada stating, "We spent a little time together. She didn't have much time for prep or research," Bloom tells ET Canada's Matte Babel. "I was blown away by her performance by how right it was and how deep and understood I felt by her performance." Principal photography began on November 9, 2016, in Toronto. Production concluded on February 9, 2017. Molly's Game premiered on September 8, 2017, at the Toronto International Film Festival. It was also the closing film at AFI Fest on November 16, 2017, replacing All the Money in the World. It began a limited release in North America on December 25, 2017, before expanding wide on January 5, 2018. The film was previously slated to be released on November 22, 2017, before being moved to the Christmas date in October 2017. Molly's Game grossed $28.8 million in the United States and Canada, and $30.5 million in other territories, for a worldwide total of $59.3 million. On Christmas Day, the film debuted with $1.04 million from 271 theaters. In its first full weekend, the film grossed $2.3 million, finishing 13th at the box office. The film expanded wide on January 5, 2018, alongside the opening of Insidious: The Last Key, and was projected to gross around $6 million from 1,608 theaters in its opening weekend. It ended up debuting to $6.9 million, finishing 7th at the box office. The following weekend it dropped 44% to $3.9 million, finishing 11th. In its third week of wide release the film grossed $1.7 million, finishing 19th. The film also grossed a total of $4.5 million in France and $5.3 million in the United Kingdom. On review aggregator Rotten Tomatoes, the film has an approval rating of 82% based on 272 reviews, with an average rating of 7.2/10. The website's critical consensus reads, "Powered by an intriguing story and a pair of outstanding performances from Jessica Chastain and Idris Elba, Molly's Game marks a solid debut for writer-director Aaron Sorkin." On Metacritic, the film has a weighted average score of 71 out of 100, based on 46 critics, indicating "generally favorable reviews". Audiences polled by CinemaScore gave the film an average grade of "A–" on an A+ to F scale. Peter Debruge of Variety praised Sorkin's script, saying, "... Molly's Game delivers one of the screen's great female parts — a dense, dynamic, compulsively entertaining affair, whose central role makes stunning use of Chastain's stratospheric talent." Mike Ryan of Uproxx gave the film 9/10, writing, "Molly's Game is a perfect story for Sorkin. There's poker, the Russian mafia, the Italian mafia, celebrities, and sports. The only thing missing for Sorkin's wheelhouse is President Bartlet. And at over two hours long, the film still feels tight and never fails to entertain." Writing for Rolling Stone, Peter Travers gave the film 3 out of 4 stars, saying, "Molly's Game bristles with fun zingers, electric energy and Sorkin's brand of verbal fireworks – all of which help enormously when the movie falters in fleshing out its characters. Still, in his first film with a female protagonist, the writer-director has hit on a timely theme: the tribulations of being a woman in a man's world." Chastain's portrayal of Molly Bloom was praised by The Hollywood Reporter, for "Chastain roars through the performance with a force and take-no-prisoners attitude that keeps one rapt." The Hollywood Reporter also stated: "Sorkin keeps things rolling relentlessly and gets fine results from the actors down the line [...]. [...] The film looks sharp and a trio of editors keeps thing pacey despite the 140-minute running time." It concluded: "One strong woman and many rich men make for a good show." ^ a b "Molly's Game". Toronto International Film Festival. Archived from the original on August 16, 2017. Retrieved August 15, 2017. ^ a b D'Alessandro, Anthony (January 3, 2018). "'Insidious: The Last Key' To Scare Up Biz In Strong Holiday Holdover Period – Box Office Preview". Deadline Hollywood. Penske Business Media. Retrieved January 3, 2018. ^ a b "Molly's Game (2017)". Box Office Mojo. Retrieved July 19, 2018. ^ Giles, Jeff (January 4, 2018). "Insidious: The Last Key Unlocks Few Scares". Rotten Tomatoes. Fandango Media. Retrieved January 5, 2018. ^ a b Rubin, Rebecca (December 11, 2017). "Golden Globe Nominations: Complete List". Variety. Penske Business Media. Retrieved December 11, 2017. ^ "The Shape of Water leads Bafta nominations". BBC News. BBC. January 9, 2018. Retrieved January 9, 2018. ^ a b McNary, Dave (January 4, 2018). "Writers Guild Awards: 'Get Out,' 'Call Me by Your Name,' 'Lady Bird' Nab Nominations". Variety. Penske Business Media. Retrieved January 4, 2018. ^ Lewi, Hilary (December 25, 2017). "'Molly's Game' Team Talks Making Timely Tale of Female Empowerment". The Hollywood Reporter. Prometheus Global Media. Retrieved December 29, 2017. ^ Fleming, Mike Jr. (November 12, 2014). "Mark Gordon & Aaron Sorkin Team On Molly Bloom High-Stakes Poker Memoir". Deadline Hollywood. Penske Business Media. Retrieved January 8, 2016. ^ "'Poker princess' Molly Bloom on her stranger-than-fiction life". BBC News. BBC. December 10, 2017. Retrieved January 3, 2018. ^ Ransome, Noel (December 27, 2017). "The true story behind "Molly's Game" is wild". Vice. Vice Media. Retrieved January 3, 2018. ^ Kit, Borys (January 7, 2016). "Aaron Sorkin to Make Directorial Debut With Underground Poker Drama 'Molly's Game'". The Hollywood Reporter. Prometheus Global Media. Retrieved January 8, 2016. ^ Sneider, Jeff (May 6, 2016). "Sony Drops Aaron Sorkin's 'Molly's Game,' Film to Be Shopped at Cannes". TheWrap. Retrieved May 7, 2016. ^ Donnelly, Matt (May 13, 2016). "STX Circles Aaron Sorkin's 'Molly's Game' Rights for $9 Million". TheWrap. Retrieved May 26, 2016. ^ Sneider, Jeff (February 18, 2016). "Jessica Chastain Offered Lead in Aaron Sorkin's 'Molly's Game'". TheWrap. Retrieved May 7, 2016. ^ Kroll, Justin (May 6, 2016). "Idris Elba in Talks to Join Jessica Chastain in Aaron Sorkin's 'Molly's Game' (EXCLUSIVE)". Variety. Penske Business Media. Retrieved May 7, 2016. ^ Robinson, Will (September 7, 2016). "Michael Cera in talks for Aaron Sorkin's poker biopic Molly's Game". Entertainment Weekly. Time. Retrieved November 9, 2016. ^ Kroll, Justin (October 17, 2016). "Kevin Costner Eyes Aaron Sorkin's 'Molly's Game' With Jessica Chastain, Idris Elba". Variety. Penske Business Media. Retrieved November 9, 2016. ^ N'Duka, Amanda (October 21, 2016). "'Molly's Game' Adds Brian d'Arcy James; Andrew J. West Cast In 'Antiquities'". Deadline Hollywood. Penske Business Media. Retrieved November 9, 2016. ^ Sneider, Jeff (November 9, 2016). "Chris O'Dowd joins Jessica Chastain and Idris Elba in Aaron Sorkin's 'Molly's Game'". Mashable. Ziff Davis. Retrieved April 23, 2018. ^ West, Rachel (January 16, 2018). "Molly Bloom Talks Jessica Chastain's Performance In 'Molly's Game', Incident With Tobey Maguire". Entertainment Tonight Canada. Corus Entertainment. Retrieved April 23, 2018. ^ "PRINCIPAL PHOTOGRAPHY BEGINS ON AARON SORKIN'S MOLLY'S GAME STARRING JESSICA CHASTAIN AND IDRIS ELBA". Entertainment One. November 9, 2016. Archived from the original on November 27, 2016. Retrieved November 9, 2016. ^ "Molly's Game" (PDF). Current Basic Agreement Production List. Directors Guild of America. Retrieved January 20, 2017. ^ Evans, Greg (November 12, 2017). "Aaron Sorkin's 'Molly's Game' Replaces Kevin Spacey Film At AFI Fest". Deadline Hollywood. Penske Business Media. Retrieved November 13, 2017. ^ D'Alessandro, Anthony (October 6, 2017). "'Molly's Game' To Open Christmas Day Instead Of Thanksgiving Stretch". Deadline Hollywood. Penske Business Media. Retrieved October 6, 2017. ^ Knapp, JD (July 1, 2017). "STX Sets Dates for 'Molly's Game,' 'Happytime Murders' With Melissa McCarthy". Variety. Penske Business Media. Retrieved July 2, 2017. ^ a b D'Alessandro, Anthony (December 26, 2017). "'Last Jedi' Now At $99M, 'Jumanji' Huge At $72M+; 'All The Money In The World' Opens To $2.6M – Christmas Weekend". Deadline Hollywood. Penske Business Media. Retrieved December 26, 2017. ^ D'Alessandro, Anthony (December 31, 2017). "'Last Jedi' & 'Jumanji' Duel For No. 1 Over New Year's Weekend As 2017 Box Office Closes With $11.1B – Sunday Update". Deadline Hollywood. Penske Business Media. Retrieved December 31, 2017. ^ D'Alessandro, Anthony (January 7, 2018). "'Jumanji' Goes Wild With $36M; 'Insidious' Rises To $29M+ – Sunday AM B.O. Update". Deadline Hollywood. Penske Business Media. Retrieved January 7, 2018. ^ D'Alessandro, Anthony (January 14, 2018). "'Jumanji' Roars To $34M; 'The Post' Still The Most With $22M+; 'The Commuter' Punches $16M: MLK Weekend Box Office Update". Deadline Hollywood. Penske Business Media. Retrieved January 15, 2018. ^ D'Alessandro, Anthony (January 21, 2018). "January Slows As 'Jumanji' Takes No. 1 For 3rd Weekend With $19M To $20M; Older Guy Pics '12 Strong' & 'Den Of Thieves' In Mid-Teens". Deadline Hollywood. Penske Business Media. Retrieved January 21, 2018. ^ "Molly's Game: Foreign Box Office". Box Office Mojo. IMDb. Retrieved March 14, 2018. ^ "Molly's Game (2017)". Rotten Tomatoes. Fandango Media. Retrieved January 3, 2019. ^ "Molly's Game Reviews". Metacritic. CBS Interactive. Retrieved January 16, 2018. ^ Debruge, Peter (September 8, 2017). "Toronto Film Review: 'Molly's Game'". Variety. Penske Business Media. Retrieved September 9, 2017. ^ Ryan, Mike (September 8, 2017). "TIFF Review: Jessica Chastain Absolutely Owns Aaron Sorkin's 'Molly's Game'". Uproxx. Retrieved September 9, 2017. ^ Travers, Peter (December 23, 2017). "'Molly's Game' Review: Jessica Chastain Turns Poker Biopic Into Royal Flush". Rolling Stone. Retrieved December 25, 2017. ^ a b c McCarthy, Todd (September 8, 2017). "'Molly's Game': Film Review | TIFF 2017". The Hollywood Reporter. Prometheus Global Media. Archived from the original on March 10, 2018. Retrieved December 19, 2017. ^ Lee, Ashley (January 17, 2018). "AARP's Movies for Grownups Awards: 'The Post' Leads Nominees". The Hollywood Reporter. Prometheus Global Media. Retrieved January 17, 2018. ^ Appelo, Tim (February 5, 2018). "Complete List of Winners at the 2018 Movies for Grownups Awards". 17th Annual Movies for Grownups Awards. AARP. Retrieved April 23, 2018. ^ THR Staff (January 23, 2018). "Oscars: 'Shape of Water' Leads With 13 Noms". The Hollywood Reporter. Prometheus Global Media. Retrieved January 23, 2018. ^ "2017 AWFJ EDA Award Nominees". Alliance of Women Film Journalists. Archived from the original on January 3, 2018. Retrieved January 3, 2018. ^ Giardina, Carolyn (January 3, 2018). "'Dunkirk,' 'Shape of Water,' 'Baby Driver' Among ACE Eddie Awards Nominees". The Hollywood Reporter. Prometheus Global Media. Retrieved January 3, 2018. ^ Ritman, Alex (January 8, 2018). "BAFTA Awards: 'Shape of Water,' 'Three Billboards,' 'Darkest Hour' Lead Pack of Nominations". The Hollywood Reporter. Prometheus Global Media. Retrieved January 8, 2018. ^ Kilday, Gregg (December 6, 2017). "2018 Critics' Choice Awards: 'The Shape of Water' Leads With 14 Nominations". The Hollywood Reporter. Prometheus Global Media. Retrieved December 6, 2017. ^ Mixner, Selina (November 13, 2017). "DFF40: 40th Denver Film Festival Announces Award Winners". Awards Circuit. Retrieved November 14, 2017. ^ Giroux, Chris (December 4, 2017). "Detroit Film Critics Society announce 2017 film nominations". Film Obsession. Retrieved December 4, 2017. ^ FFCC (December 20, 2017). "'The Shape of Water' Leads 2017 Florida Film Critics Awards Nominations". Florida Film Critics Circle. Retrieved December 21, 2017. ^ FFCC (December 23, 2017). "2017 FFCC Winners". Florida Film Critics Circle. Retrieved December 23, 2017. ^ "2017 Awards". Georgia Film Critics Association. Retrieved January 8, 2018. ^ Tangcay, Jazz (October 17, 2017). "Mill Valley Film Festival Names Mudbound and Molly's Game among its Audience Favorites". Awards Daily. Retrieved October 22, 2017. ^ McNary, Dave (December 5, 2017). "Jessica Chastain Honored by Palm Springs Film Festival for 'Molly's Game'". Variety. Penske Business Media. Retrieved December 5, 2017. ^ Pedersen, Erik (January 5, 2018). "PGA Awards Film & TV Nominations Unveiled". Deadline Hollywood. Penske Business Media. Retrieved January 5, 2018. ^ SFFCC (December 10, 2017). "2017 SAN FRANCISCO FILM CRITICS CIRCLE AWARDS". San Francisco Film Critics Circle. Retrieved December 16, 2017. ^ Pond, Steve (November 29, 2017). "'Dunkirk,' 'The Shape of Water' Lead Satellite Award Nominations". TheWrap. Retrieved November 28, 2017. ^ Lewis, Hilary (January 16, 2018). "'Disaster Artist,' 'Logan,' 'Wonder Woman' Among USC Scripter Award Finalists". The Hollywood Reporter. Prometheus Global Media. Retrieved January 16, 2018. ^ Gordon, Tim (December 8, 2017). "The 2017 WAFCA Awards". Washington D.C. Area Film Critics Association. Retrieved December 16, 2017. ^ "AARON SORKIN TO RECEIVE ZFF CAREER ACHIEVEMENT AWARD / MOLLY'S GAME AS GALA PREMIERE". Zurich Film Festival. September 8, 2017. Retrieved October 22, 2017.